Talk about war and peace. And for 137 minutes, the couple-dozen people at the Regal Cinemas’ Shoppingtown complex theater for a late Friday matinée soaked it up quietly, groups of teens perhaps already taken by The Hunger Games novels of Suzanne Collins, and certainly women of various ages there to admire the strength, intelligence and emotional range of the leader of the rebels, Everdeen. 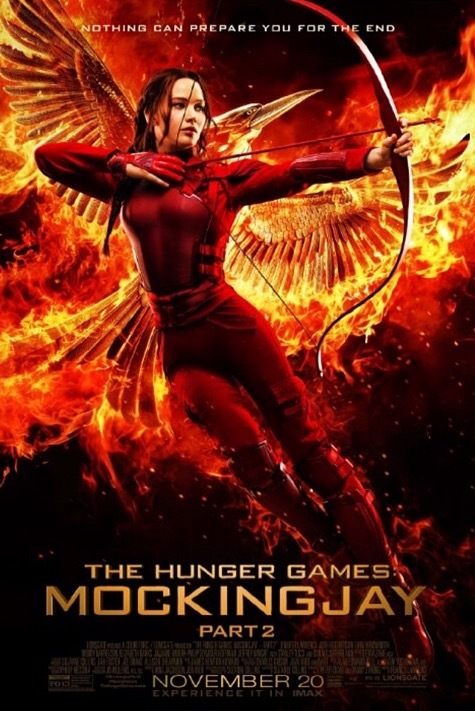 The story does not disappoint, putting Katniss and her tight and dwindling group in enough dastardly dystopian situations as they wind their way through the dark future world toward the mansion home of President Snow. Donald Sutherland smugly smiles his way through the battles as he attempts to remain in control of Panem, mind-controlling the factions as Everdeen and rebels attempt to finish the mission of President Alma Coin. Julianne Moore is equally assured in her own way, leading her panel that includes small but significant roles from familiar faces played by Woody Harrelson, and even bittersweetly the late Philip Seymour Hoffman. Out in battle, the rebels face scary black ooze thrown at them by snow and an internal battle unleashed by events and mind games. But the most frightening scene comes underground, with startling beings that make ‘gators look like cute and friendly puppy dogs. Through it, Katniss also has to deal with matters of the heart, family wise and romantic, too, as actors Josh Hutcherson as Peeta and Liam Hemsworth as Gale again take turns helping her really and haunting her thoughts. If you haven’t read the last book, the ending is nicely twisty. Do you think a movie franchise should end with the books from which it came, or be extended with new scripts if it successful? If you’ve been part of ‘The Hunger Games’ craze, what drew you in? What’s your favorite Jennifer Lawrence movie, and why? I’ll be seeing this movie at some point. I hope they don’t try to extend the movie franchise beyond the books. Jennifer Lawrence was brilliant in “Winter’s Bone”–maybe her first movie? I don’t think that many people know about it, but it was a wonderful movie, and she was great (as was John Hawkes). I’ll have to find “Winter’s Bone” on your recommendation, Merril. JL is a gem, she really go me in ‘Silver Linings Playbook’ and ‘American Hustle’ as well as the HG franchise. Let me know if you see it, Mark. It might not be your thing, but she is amazing. I hope you agree that they did it with a good bow (and arrow), Van. You’re welcome, my friend. I was disappointed by the last film, and honestly I am glad the series is over. It is what it is, ZP. Thanks for your thoughts, as always. Okay, Mark. I guess I’ll watch all these movies, when I can find the time. Thanks for adding more things to my “To Do” list. Looking forward to seeing the last film! All things have a shelf life, we should not go over! Yes, this seemed like the perfect way to end this series, Willow. Still no word from Paul here. You? No I have tried but absolutely nothing. I do hope he is okay. Yes I would of thought so, maybe he is in hospital with no access to a commuter,? This would be such a long stretch hospitalized. I googled last night looking for him. Again. No luck. I am at a loss as what go do. Me, too. I think I will start calling hospitals after our Thanksgiving, Willow. I really appreciate that I feel so far away. Okay, so the kids brought back mediocre results in comparison, Mark. They had all read the book and I think already formed the opinion that the plot line wasn’t as strong as the first. One of the friend’s defined it as ‘some great scenes in an otherwise mediocre movie’. They were going on quite a bit at what I can only imagine could be the startling beings in the battle though. Anyway, just sharing the opinion of 13-14 y.o.’s. Those beings in the battle scared the crap out of me, Marissa. And not having read the book, I wasn’t colored for that always disappointing comparison. The book is always better than the movie, right? Thanks for the West Coast teen reviews! i thought the first book was, by far, the best of the lot. I’m still looking forward to seeing this flick, though. J-La makes it worthwhile, Austin. She is a great actress. Yep, Merrildsmith nailed it, “Winter’s Bone”. As she mention it is not as well know as the “Hunger Games” but it is the first movie in which Jennifer was recognized for her talent. It is a great movie worth watching in its own right albeit disturbing. I will be disturbed to get the talented JLa, DE. For sure. My family has been to every HG movie since they came out! I think there probably won’t be many movies which will unite us as a family going forward for the next few years as the boys go through their teens like this series has. Jennifer is a great role model for young girls and indeed younget men… she plays a great female lead, strong but not kickass, emotional but not weak, and while beautiful, is a real womanly shape, not unrealistically stick thin with fake… um . .. enhancements! Thumbs up all round, and sorry it’s over, but no… leave it as is, creating more stories around it would just weaken it in my view. I hope another set of writer/director and actress/actor come along to bond your family, Ali. Your comment is a sure sign of success for these folks who put out this ‘Hunger Games’ franchise. The movie people and our world need more of this, I think. If families can go home from a theater and talk about the positive aspects … Better world! I always like the book better, Sadie. Well, almost always. The same day, though, that would be weird. If we lived near each other, I’d love to pick a book/movie combo we’d both not read nor seen, and read it and watch it on the same day together, and both write a blog about the experience. Would the friendship survive? As Paul would say … Ha!